I’m not sure I want to watch all of those dreams. on the other hand you could probably categorize them from ‘All ages’ to PG 18′ etc. I’m not sure if I would want to be able to record my own dreams for that matter…probably pretty f’ed up. I wouldn’t be surprised if animal dreams were far more complicated than we humans suspect. For the most part they are much more intelligent than we give them credit for. Take my (now deceased) cat for example, spent rather an incredible amount of time watching humans. She could open doors, she would place the mice she brought to the door on a carefully arranged garnish of leaves, and she could at least partially understand human speech. No I definetly think animal dreams would surprise us. Seriously, she knows where that light comes from and what makes it. She knows that when I pull out her laser light toy she gets to chase that little red light. If I turn it off for a moment to rest my thumb she’ll come over to me and nudge me and/or the toy itself to say “get with the program”. When I turn it back on, she forgets everything but her instincts. I guess lasers are like video games for pets. We know they’re just flashy lights that appeal to our instincts but we have a blast playing anyway. Would hamsters dream of actually getting something accomplished by running on those wheels? actually it’s theorized that hamsters run on wheels because of natural instinct. They are desert animals, and they dig new burrows every day to avoid predators. they live in a burrow for a day or two, then travel for miles in order to make a new one, which makes it hard for predators to catch them since they never stay in one location for very long. The point is, they run on their wheels because in the wild they would normally run all day anyway. They don’t really care that they’re not going anywhere, they just want to run. why am i telling you this? because these are very interesting knowledgefacts that I know because of my learnings. This reminds me of a description of the difference between heaven and hell. 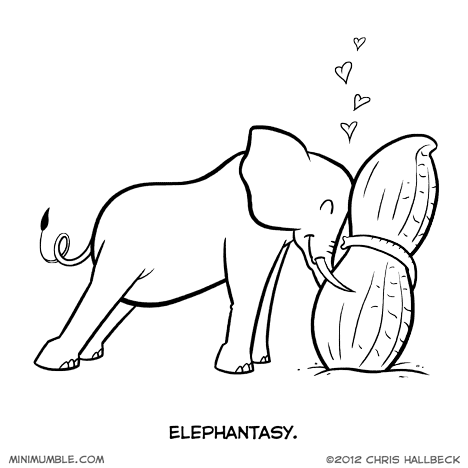 * The peanut may be an elephants favorite food but that one is way too big for it to actually eat. for a second i thought that was a cactus.